Constructed in 1958, the McGregor Memorial Conference Center was the first component of Minoru Yamasaki’s substantial body of work for Detroit’s Wayne State University. Financed by the McGregor Foundation, the building was a gift to Wayne State University for use as a community conference center. Over the years, the McGregor Memorial Conference Center has served as a gathering place for academics and leaders for social change, playing host to a variety of important historical figures ranging from Eleanor Roosevelt, Nobel Peace Prize recipient Ralph Bunch and labor leader Walter Reuther to Timothy Leary, Lyndon B. Johnson and Floyd McKissick. 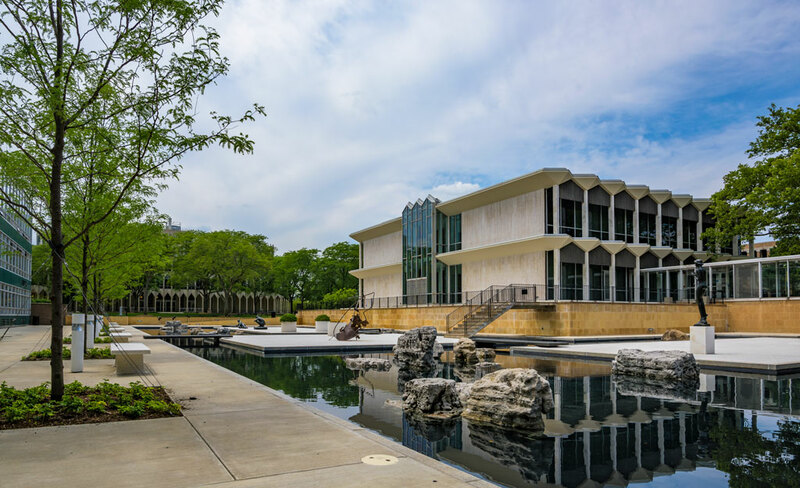 Located on the east end of the WSU campus, the McGregor Memorial Conference Center is built on a platform raised several steps above street level and overlooks a sculpture court with shallow L- shaped concrete pool and sculpture court featuring four free-standing sculptures. The two-story steel-frame and concrete folded slab Modernist building designed in the International style and marked the beginning of Yamasaki’s national and eventually international reputation as an architect. For detailed information regarding the McGregor building on the National Register of Historic Places, please click here (PDF). The National Park Service has completed the study of McGregor Memorial Conference Center, in Detroit, Michigan, for the purpose of nominating it for designation as a National Historic Landmark. To read about the property studied for National Historic Landmark Designation, please click here (PDF). For information on the nomination as a National Landmark, click here (PDF). Special thanks to Jill Halpin for her work she did as a volunteer. Her descriptions of the WSU buildings and pulling facts/information from the national register nominations are greatly appreciated. the McGregor Memorial Conference Center has served as a gathering place for academics and leaders for social change, playing host to a variety of important historical figures.